Xi’an Metro is a popular means of public means of public transportation in Xi’an, the capital city of the Chinese province of Shaanxi. The Metro service in Xi’an incorporates fifteen lines and is spread over a combined length of over five hundred kilometers. Upon completion, it is likely to traverse the suburban and urban areas of cities such as Huxian County, Lintong and Xianyang. However, at present only two of the lines are in operation- Line 2 and Line 1. Xi’an Metro has an annual ridership of 59 million and daily ridership of 470,500 passengers. Although it is named as Line 1, this is actually the second line that became operational in the Xi’an metro network. It commenced services in the month of September of 2013 and runs along an east-west direction. As per the initiative of the Chinese government to accelerate growth of trade and commerce between the industrial cities of Xianyang and Xi’an, extension plans have been made along this route. This route covers a length of around twenty-five kilometers. Kangfu Road, Chaoyang Gate, Wulukou, North Street, Laodong Road and Epang Palace are some of the main stations along this route, both as centers of commerce and tourist interest. September 2011 saw the commencement of operations along Line 2 of the Xi’an Metro network. At present it has seventeen stations to its credit and runs for around twenty kilometers of route length. Construction work is in progress on Line 3 of the metro network in the city with the expected deadline set for the year 2015. The line is planned to stretch over a length of fifty kilometers and will have as many as thirty-one stations along the length to serve commuters. By 2030, the city of Xi’an is expected to have all fifteen Metro lines completely ready and fully functional. Map of Xi’an Metro showing various lines and stations. 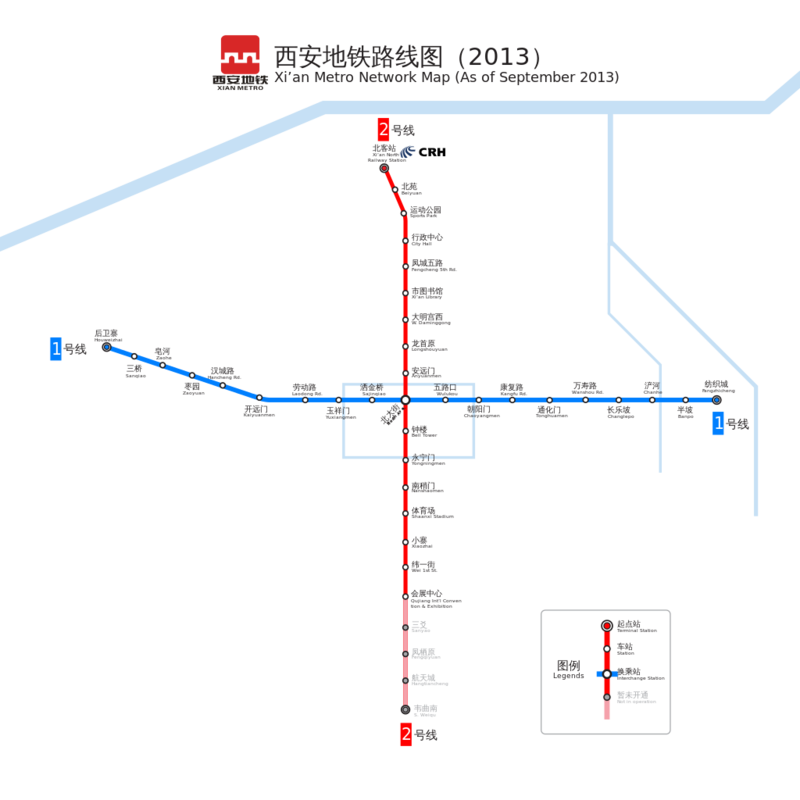 Click on the map to enlarge it or Download Xi’an Metro map in PDF.